Just had a customer call me with this odd message. She is using a fresh clean install of Windows 7 with all the updates. 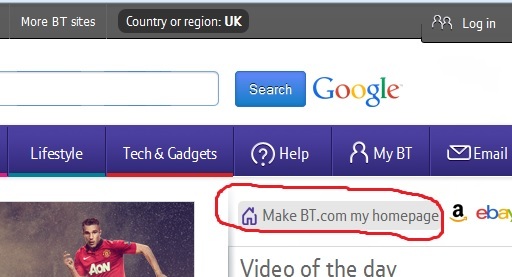 It happened when she visited BT.com and clicked the “make BT.com my homepage” button. 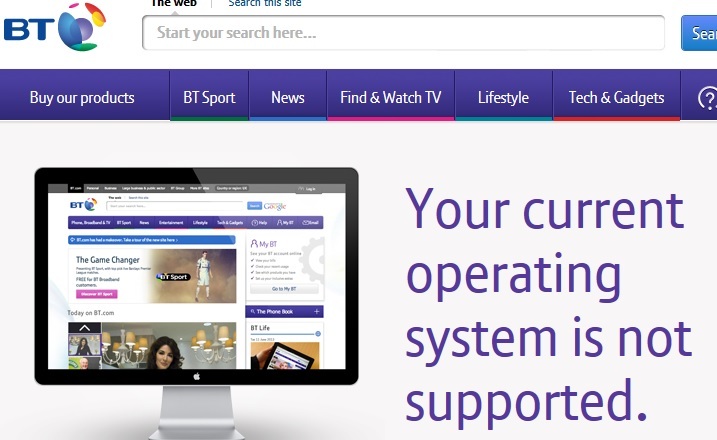 Given that Windows 7 is by far the most popular operating system on desktop and laptop computers, it was somewhat surprising that BT don’t support the majority of their customers who use proper computers. When I searched the web, it appears to be a problem with Internet Explorer 11. You can click the compatibility button in IE11 to get round the issue, or you can make it your homepage (the usual way) by clicking the gear icon at the top right, and clicking Internet Options at the bottom of the menu. Moral of the story, don’t use BT…. use gmail, livemail, or something independent of your broadband provider. There is no law that says you have to use BT mail just because they provide your broadband. This entry was posted in Blog on March 12, 2015 by admin. 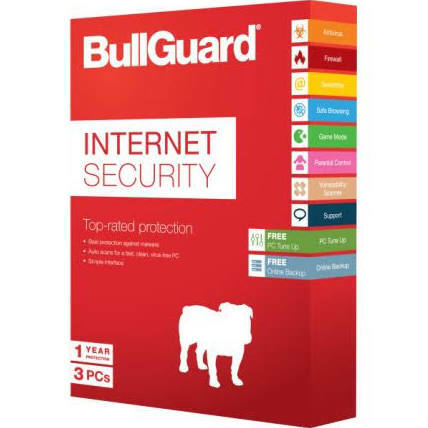 Bullguard Internet Security – 3 PC/laptop licence £15 for one week only! I have many customers using this and it has proven very effective in protecting them against malware. Only £15. Offer ends 16th March 2015. This entry was posted in Blog and tagged Anti-virus, Bullguard on March 9, 2015 by admin. They have a UK call centre, they give a fixed IP as standard, useful if you need remote access to say, a CCTV system. They also don’t block ports or do “traffic shaping” – which is where certain traffic is “deprioritised” in favour of another type of traffic. For example, they could give video downloads a slower speed than say, Skype, which can be annoying if you are trying to watch BBC iPlayer. I found ANY type of online video was impossible with XLN Telecom. They told me it wasn’t needed for a “business service”, ignoring the fact that businesses use video, or that small businesses like mine are home-based. Zen Internet also offer one month contracts, so you can easily get out if you want to. This entry was posted in Blog on March 1, 2015 by admin. With BT Openreach digging up roads all over Pembrokeshire (and the UK), let’s examine some of the “sales speak” of the misleading adverts. False, at least in all practical purposes. Firstly, the fibre optic cables only go as far as the street cabinets, and from the street cabinets to homes is using copper cables. Secondly, copper is capable of speeds of at least 10 gigabit, i.e 10,000 Meg. BT Infinity is currently running at 80 Meg. Thirdly, the maximum speed of both copper and fibre optic cables is far quicker than computer hard drives (even solid state) can operate, so any extra speed is irrelevant. So what IS special about fibre optic? The key advantage of fibre optic over copper is the preservation of data. Signal to noise ratio of copper degrades over distance, so for traditional broadband, the maximum practical range is around 5.5km from the exchange. With fibre optic, the range is, in practical terms, unlimited. So, it’s better for people who live a long way from the exchange, who struggle with slow speeds. Should I get fibre optic broadband? If you watch a lot of TV online, eg BBC iPlayer, on a single computer/internet enabled TV, and you get good regular broadband speeds, then you don’t need fibre optic. BBC iPlayer HD is streamed at 2800kbps (or 2.73Mbps) so any speed comfortably in excess of this should suffice. This entry was posted in Blog on February 22, 2015 by admin.